The relationship between the history of the paranormal, and the 'consensus' history that most of us, informed by historians and the mainstream media, agree on as real, is usually pretty distant. Forteanism could be said to lie somewhere between these two histories, in that it notes the allegedly factual, but possibly anomalous accounts recorded in the media of 'consensus' history, while often rejecting the 'consensus' explanations given for dismissing the strangeness of those events, and the rationale and reasoning adopted in doing so. Fort was lucky to live and work before the worst excesses of Ufology and the New Age appeared. His method of approaching existing, already-recorded facts with an open and wide-ranging mind would often have been thwarted by the sheer lack of facts, and the predominance of imaginary elements, in both of those disciplines. He was generally able - and willing - to trust the reports his research uncovered. To take that approach now would invite ridicule. Fatima visions and the 'Dance of the Sun' were becoming a 'classic UFO event', artificially extending the history of the UFO thirty years back before 1947. The 'Angels of Mons' legends, in contrast, were being too readily debunked. The usual sceptical explanation was too trite, and I think mistaken. Similarly, most of my research has been in areas where, although the phenomena in question has been visible - audible, tangible even - to certain individuals, its visibility has been selective. There was always room for a debate about why certain persons subjectively perceive extraordinary sights, and events, and information, while others do not. The situation here, where vast metal disks were meant to be thundering across the European skies before the summer of 1945, is completely different. They were either there or they weren't. 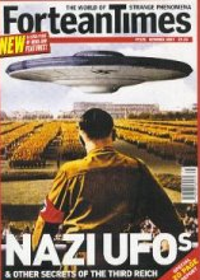 What prompted me to start questioning the accepted wisdom about 'Nazi UFOs' was that awful period in Fortean history, two or three years ago, when newsstand magazines of limited quality and dubious intentions blossomed all over the UK. In addition to FT itself and 'UFO Magazine', suddenly there was Alien Encounters, Sightings, UFO Reality and all sorts of other, short-lived titles, all struggling to fill their pages with startling and saleable material. Rotten writers started submitting articles half-heartedly strung together from a handful of second-hand sources, and a couple of hours on the Internet. The publishers accepted these articles with open arms and small amounts of money, and old myths were revived and new myths born. 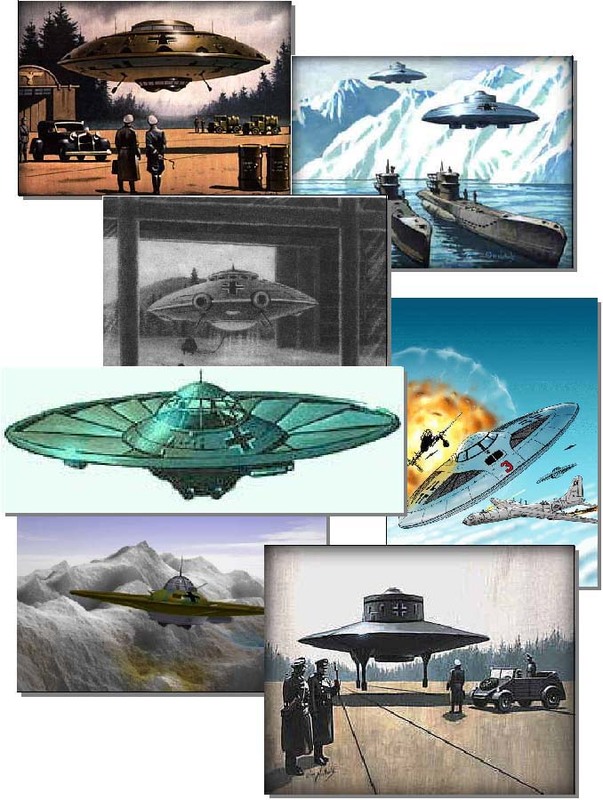 Among them were myths based around the creation and flight of Nazi UFOs. The more I looked at the emerging tales of astounding Nazi technical achievement, and compared them with Germany's ignominious and ruinous defeat, the less sense that contradiction made. It isn't - and I know I need to make this clear - that I'm asserting that the Axis had no plans, designs, or hopes for the production of high-performance flying disks. Nazi Germany was good at plans, and designs, and - perhaps fortunately for the rest of the world - wasted much time on speculation, and dreams of achievement and power. 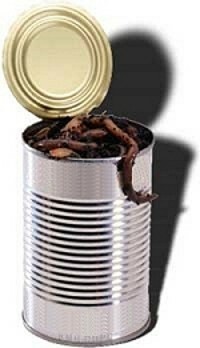 But it looks as though no high-performance disc so much as left the ground, and if that proposition is true then the Nazi UFO mythos, now celebrating a half-century of vigorous existence, is the most sustained, widespread, complex and multi-faceted hoax ever contrived in our field. A hoax, strangely enough, in which few of the principal participants even knew each other, but which has attracted hundreds to play their part in its development and many, many more individuals to believe that some or all of its claims are true. Tentative as some of my findings of fact may be as yet, what is published here is what I've established so far. This is not a story with a beginning, a middle and an end. Like all the best myths it starts when somebody either thought of it, or first recounted publicly a pre-existing tale. It looked to the past to find support for its claims and then, as time went on, spiralled out of control as further elements were added. My intention in setting out this 'first investigation' of the Nazi UFO mythos is to make available, in one place, the principal sources for all of the reports and claims that seem relevant and of which - of course - I'm aware. I'm sure there will be more. I make no pretence of having done all this work myself, or of having any kind of monopoly on the subject. If others want to use this piece as a basis for pursuing their own research, I'll be more than pleased. If I've quoted or adopted anyone else's work without crediting it, please accept my apologies. One brief explanation in advance - while I've almost certainly made errors of my own in translation, and the names of people and places, I've generally refrained from correcting the spelling and grammar of quoted material. Sometimes, style and presentation conveys almost as much as content! I'll start by giving a substantial overview of what is probably the only genuine unsolved mystery in all of the speculation about wartime aeronautical technology - the Foo Fighters.